Pear, pine and anise flavors are focused and clean in this firm white. Mineral-tinged acidity provides real backbone, with citrus and floral notes lingering on the finish. Drink now through 2011. Greenish gold. Spicy quince and pear aromas are deepened by smoky lees and sharpened by white pepper and ginger. 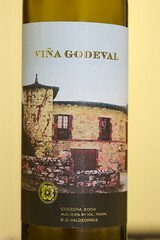 Very dry, with sharply focused citrus and green apple flavors and slow-mounting spice character. Picks up an earthy tarragon quality on the long, sappy finish. This is drinking wonderfully.